in response to white's low approach is a hamete and is referred to as the Drooping Lotus. 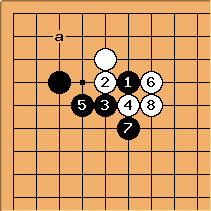 It's one of the oldest named hametes in go. If White responds correctly, Black's result is slightly inferior. Pushing through with is the obvious response. 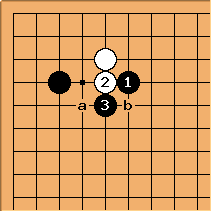 After , white has two ways to cut, a and b. Cutting with a is a mistake, and white will get a bad result. Cutting with b is correct. 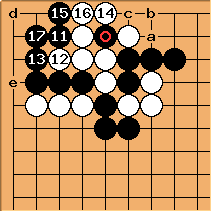 The normal continuation sees both players getting influence. 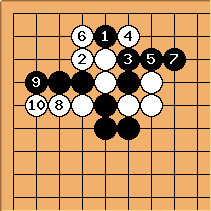 Black keeps sente, but white's shape is somewhat thicker than black's shape. This is considered slightly better for white. If white cuts with , play continues like this. After , both players have influence, like in the correct continuation, but black's shape is thicker here. 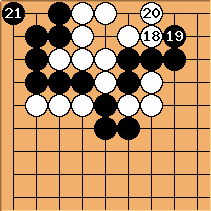 Also, due to the liberty filled by , black now has a tesuji at a to claim a big corner. 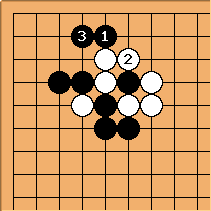 The tesuji allows black to claim a large corner. White might be tempted to resist like this, but it ends in disaster. After , white has four liberties (at a, b to approach, c to atari, to capture), so white cannot play d to kill as she will lose the semeai. 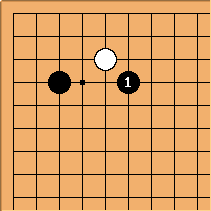 White can continue with e, but that also does not work. White has little choice but to live and ends up with too many problems.